There is something deliciously dark and mysterious about the film noir-esque sounds presented on "Legacy of the witty" by Trigg and Gusset on Preserved Sound ... something very David Lynch. Slow, lazy percussion ... haunting piano ... and some seriously sensual yet rather melancholic saxophone ... all come together to make this late night soundtrack. Add the odd synth and percussive sample ... and wow, what an album. There is even a double bass on a few tracks which is just icing on the cake. As I mentioned above, there is a very real Film Noir influence ... these tracks could so easily feature in a David Lynch film ... something as equally dark and intriguing as the music on offer. With Bart Knol on keys, beats, synths, and samples ... and Erik van Geer on tenor sax and bass clarinet ... this is some lovely music. Throw in Dominique Bentvelsen on double bass on four of the tracks and you have something beautiful indeed. The melodies articulated by the saxophone are simply breathtaking ... they are the eloquent expression of someone who knows how to play ... and play well. Passionate & expressive yet unhurried ... I found these melodies an utter joy to consume. 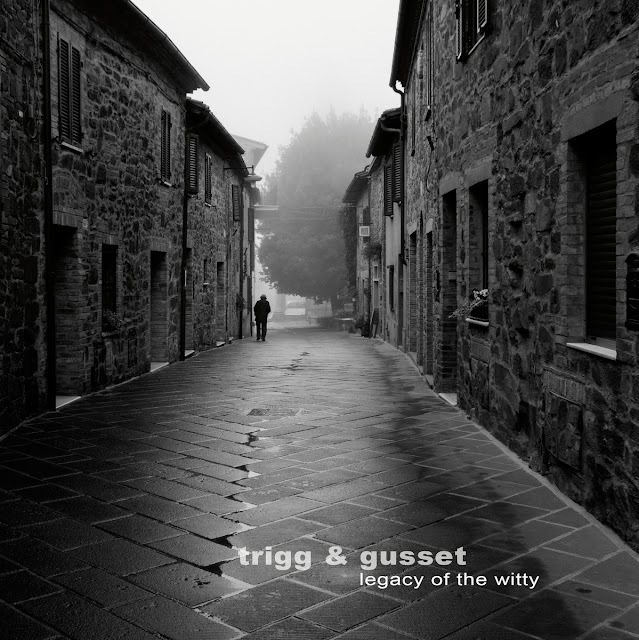 "Legacy of the witty" by Trigg and Gusset has an utterly delightful late-night vibe ... a wind-down, chill-out, Friday-night kind of vibe. Put it this way ... it's hard to consume on the train after a day in the office - I've been left snoozing and have nearly missed my stop on a couple of occasions as I've tried to take it all in. This is not a criticism but more an observation as to how perfect it is in its intended role. I would heartily recommend this release and must give special mention to the closing track - "Avant Noir" - for truly encapsulating the fabulousness of this release. Low, growly bass clarinet ... subtle synths and gently, deliberate percussion ... samples and electronic manipulation ... and double bass, lots of beautiful, lilting double bass ... all come together to make this the stand-out track on the album. My thanks to Preserved Sound for giving me the opportunity to listen to and review this album. It is remarkable. Check it out below.